What is the best Valentines Day Gift Idea? Well, you’ve got a few weeks to think that over. However, it’s never too early to consider what to get that special relative or significant other. Here are just a few ideas to think about. Giving your loved one a jewelry box is a generous sign of affection but this valentines gift idea should be given at the right time and for an appropriate relationship. A good way is to give him a gift that serves a purpose. Preferably something that is dear to him, like a new tool. Have a nice dinner then play some good, old domino! He will love this personalized sign with his name on it. This is a great gift for his indoor/outdoor home bar. If you still want to give him something special without breaking the bank, why not give him this personalized BBQ set to make his steak extra-delicious. Personalized beer glasses are a fantastic gift for this valentine; when giving a personalized beer glass as a gift you can also fill the mug with appropriate accessories. For example, a variety of gourmet tea flavors for the hot tea drinker in the family. For the career-driven person in your life, an executive pen engraved with his name is the perfect way to say “I Love You” and show how much you appreciate your hard work. Personalized flasks are a function gift. They are compact and easy to carry around. They can be discreetly stored in briefcases, jacket and trouser pockets, and even handbags. Furthermore, they have been created and engineered in such a way that there is not even the slightest risk of spillage of liquids within. Do you have a businessman in your life which you would like to present with a beautiful gift that is also functional? If so, then you should consider giving them a business card holder. Not only will he be happy to receive such a thoughtful gift, he will be very proud to use it. It is one gift that will surely not be forgotten, and it will always be appreciated. Whether it is for a husband, friend, or even a sweetie, most men can always make great use out of a valet box. Most fellows are so used to just dropping their keys and change on top of the dresser that they do not realize just how handy having a proper place for these items can be. Thanks for sharing these gift ideas on your blog. I want to make my boyfriend feel really special on this Valentine’s Day. I really like the Kings Crown Etched Glass Beer Mug and I also like the romantic notes filled-in jar concept. I think the combination of both of these two items will be the best Valentine’s Day gift for him. To add on your list, I’m also thinking of giving my husband a healthy treat. He loves granola and we love healthy eating so I think these ones gonna be great. 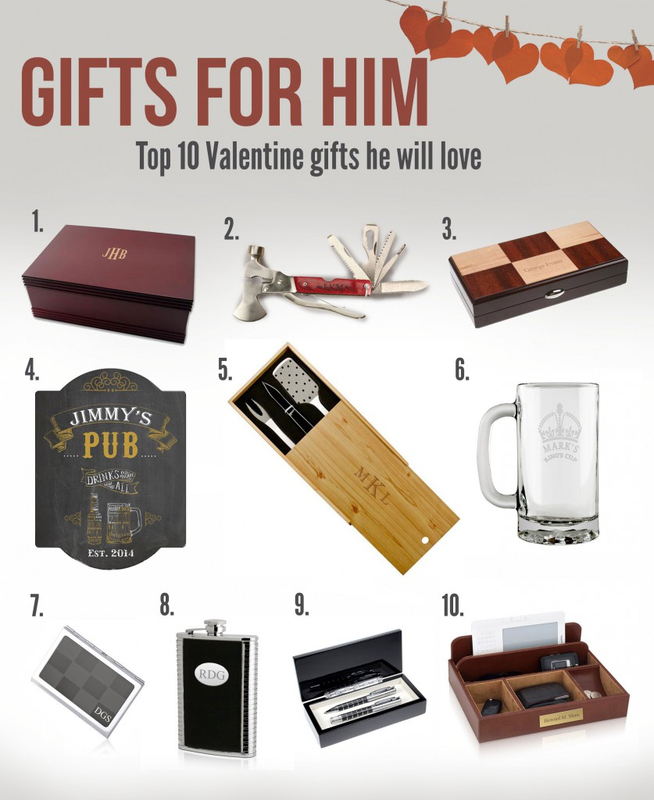 These are definitely a good set of gifting ideas to present to men.